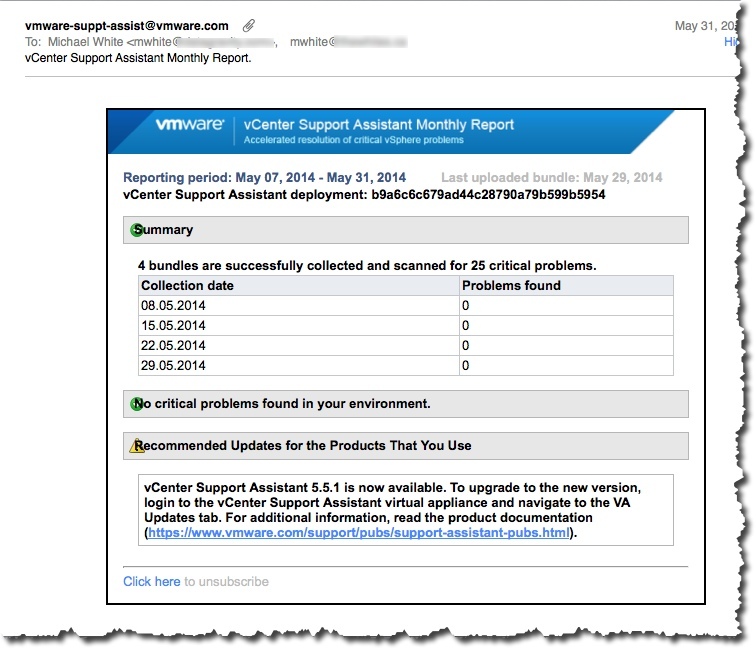 I talked about using the vC Support Assistant before. I think it is a great tool. It makes it easier to start and update SR’s and supply logs as necessary. Yesterday, in my monthly report from it I saw there was an update. See below what I saw in my email. The first thing I look at is the Problems Found column and I am happy to see it all 0’s. 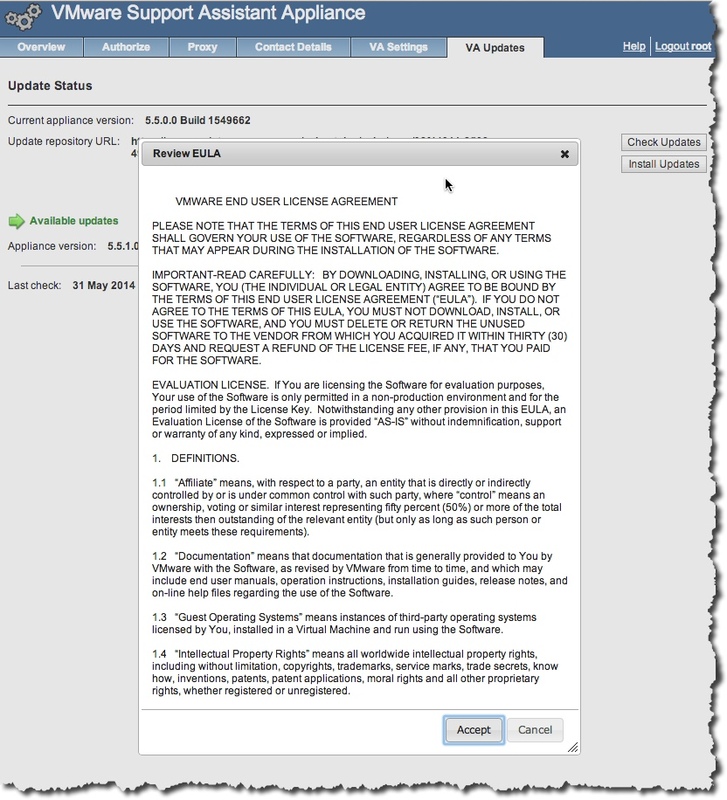 But I see in the Recommended Updates area an update for vCenter Support Assistant so that is what this article is about – doing the 5.5.1 upgrade. So the upgrade is done in the Appliance UI. 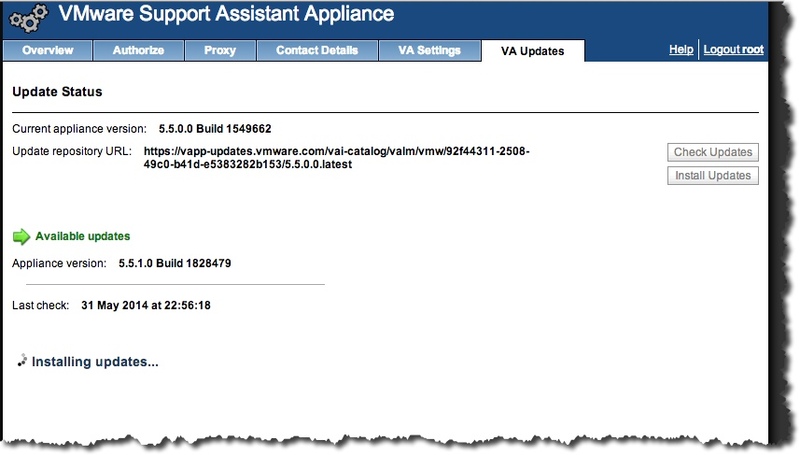 No surprise there as that is how it is done for other VMware appliances and of course that makes it pretty easy too. Once you are logged in you will see something like the following. Everything looks good here, but lets change to the VA Updates tab. On the VA Updates tab we will like see no update is available – as I did below. I use the Check Updates button and then I see an update is available. So I use the Install Updates button to get the update started. Interesting that a free product has an EULA but I have no heart to read the whole thing – even though it looks smaller than normal. So I Accept it. It starts right away with installing updates. After only a few minutes we see that the update is done. We have now successfully updated the appliance and all is good. It is important to keep current on apps that you depend on. Here are some useful links – product, pubs, and the release notes. 8/2/16 – made the screens bigger to support easier reading! 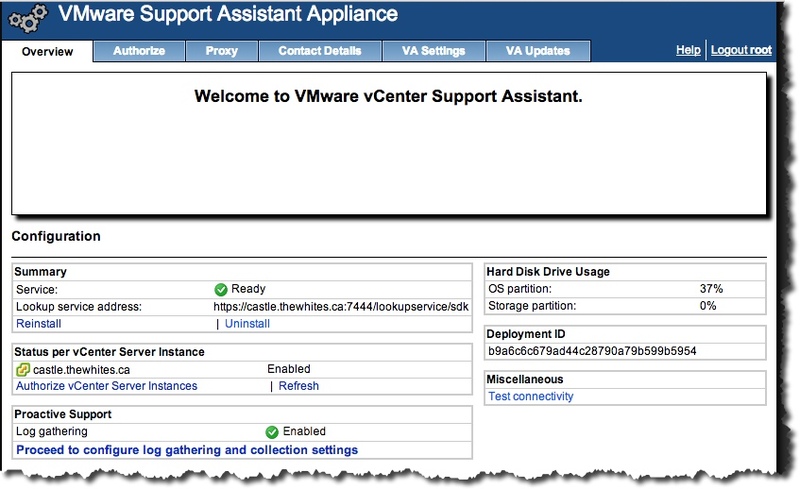 6/7/14 – saw this new GSS video on installing / upgrading and uninstalling that might be useful. Previous Post Postbox – new email starts here!